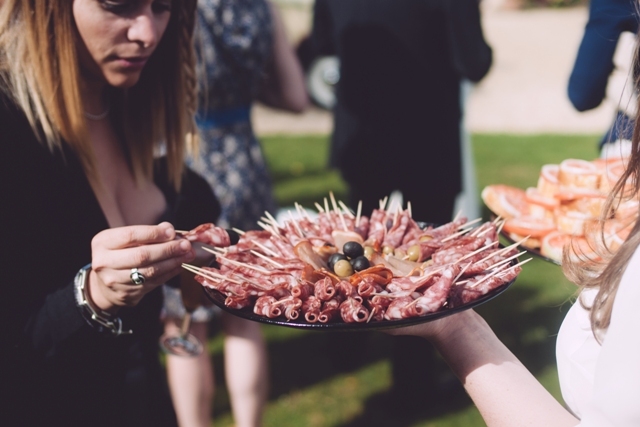 Paella Wedding Catering is a growing trend in the UK and with very good reason. Your Paella isn’t only a great tasting dish it’s also very versatile. With a range of Paella’s on offer from Shellfish only to Vegan and just about everything in between. Paella is also a healthy option to offer your guests at a Wedding. We at Your Paella specialize in Paella Wedding Catering. 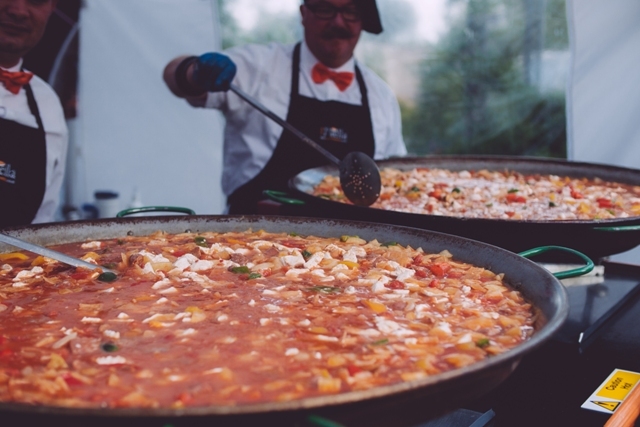 Unlike many other caterers that will try and provide anything and everything, sort of “Jack of all trades, Master of none” When it comes to cooking Paella at Weddings Your Paella are Masters! Paella Wedding Catering with the unique Paella Cart really ads to a Wedding allowing everyone to watch professional Paella chef’s work their magic. The wonderful aromas fill the air while the guests tuck into little Spanish style canapes. The famous “Paella Cart” at a Wedding. Over 100 5 Star Reviews. With over 100 5 Star client reviews, you can be confident that once you have booked Your Paella for the catering at your Wedding you and your very important guests will be in great hands. You can read many of these reviews here. 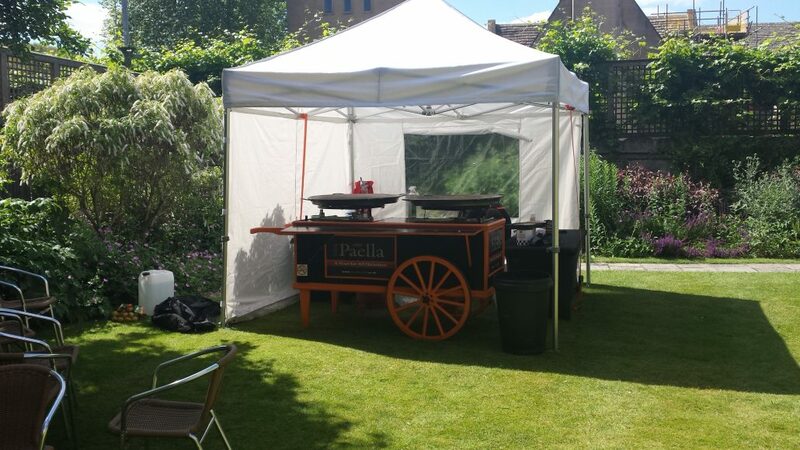 Booking Your Paella to cater at your Wedding is a very easy process. 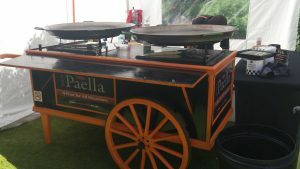 You can Contact Us through our website www.yourpaella.co.uk or call us for an immediate response on 07989079231. We are always happy to chat about your big day and give professional advice for you Paella Wedding Catering. Below you can watch a video of Your Paella as they get ready to cook at a Wedding for 120 guests. You can also watch many more Videos of Your Paella at various sites cooking their delicious Paella’s here. 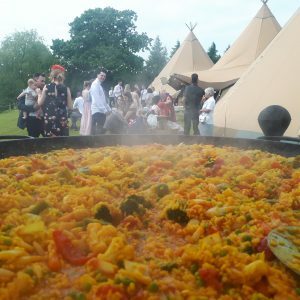 Paella Wedding Catering Milton Keynes Buckinghamshire. 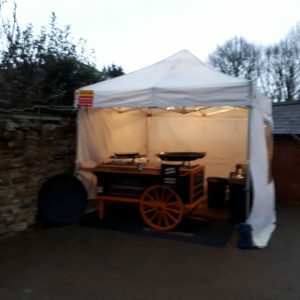 Your Paella cover the whole of the UK and have cooked fantastic tasting Paella’s, tapas and starters at many Weddings, private party’s and corporate events. We really do enjoy what we do and every occasion is different. It’s great to see what our hosts have planned for the Wedding or Party, you just never know what to expect. When I arrived at the Wedding location in Milton Keynes Buckinghamshire all I could see was a huge Ti-Pi tent and some portable loos. I have catered for other Weddings where they have used these huge Ti-Pi tents and we were once again recommended to the couple by www.samitipi.co.uk It looked fantastic as usual. As normal I found out where I was to set up the famous “Paella Cart” and set to work. I tend to arrive on site around 4 hours before the serving time so it’s a nice relaxed set up. It also allows for any problems on route to the venue. The DJ arrived and also began to set up. I was impressed with not only the DJ area but with all the other fun things they had provided. Pop corn machine, Candy floss machine and a Magic selfie mirror! Apparently www.boothbirdy.com can supply a host of great items for any party or Wedding. They are well worth a look at if you need this type of equipment and service. If you’re interested in having the great taste and theater of Your Paella at your Wedding or Party just contact us and we will be more than happy to discuss your requirements. Your guests will be so glad you did. 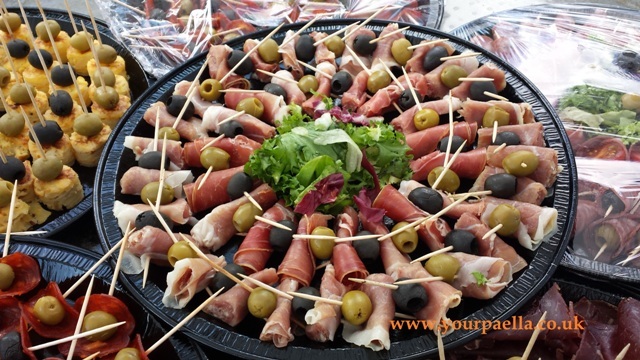 With over 100 5 Star online reviews you know that you will get the the catering service you are looking for. 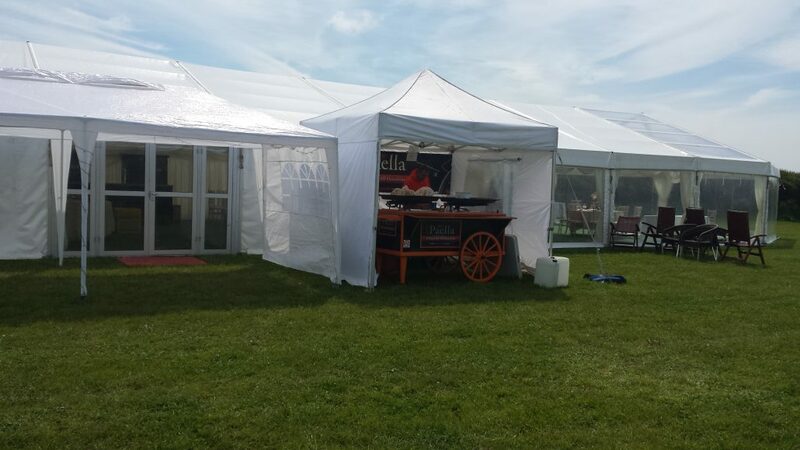 Paella Catering in Devon and Cornwall. 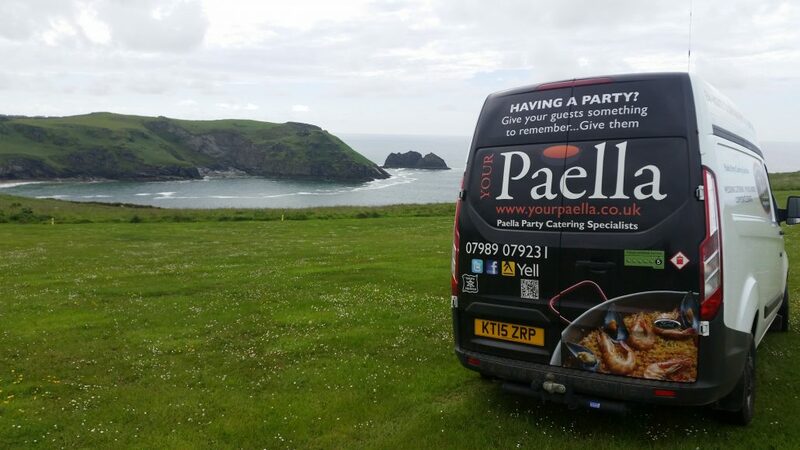 Paella Catering in Devon and Cornwall is always great fun for us at Your Paella. Why’s that I here you ask? 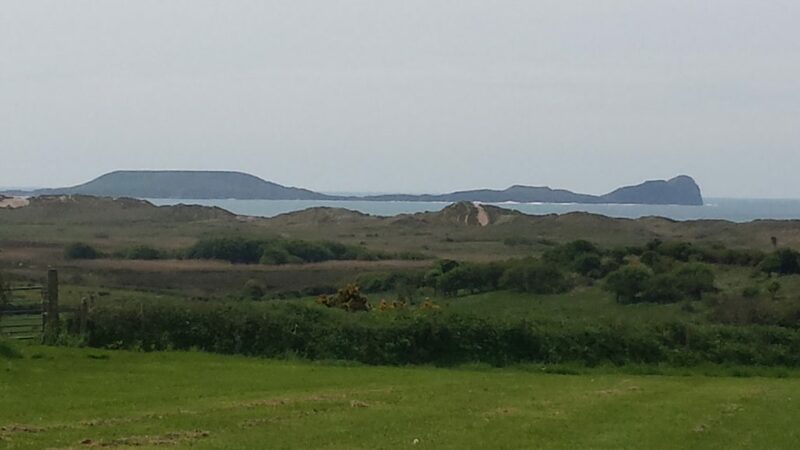 Well not only do we get out of the built up towns and city’s but on the whole we get to see the beautiful coast line and in many cases we have even set up and cooked in some absolutely beautiful scenery. As you can see from the image above, it’s wonderful for us to cook delicious Paella with this kind of coastal view. Then to hear them comment on how great the aromas are coming from our small white pop up tent that we cook and serve from. It’s even more satisfying for us to hear how great tasting Your Paella is! 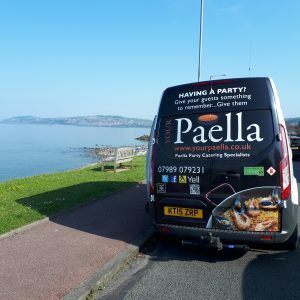 All of the Paella Catering that we have done in the Devon and Cornwall area have been for weddings but that doesn’t mean that we can’t cater for a party or corporate event in Devon or Cornwall. Far from it, we are more than happy to travel to your party or corporate event and wow you and your guests with Your Paella. Book Your Paella for your special day. 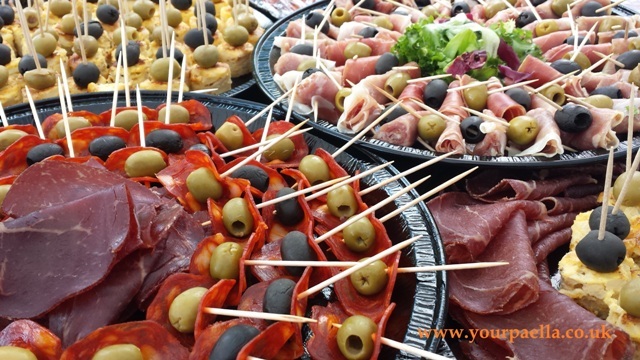 If you are interested in providing great food with a touch of Theatre for your next party or any special occasion, please do contact us as we are happy to provide you with a free no obligation quote. 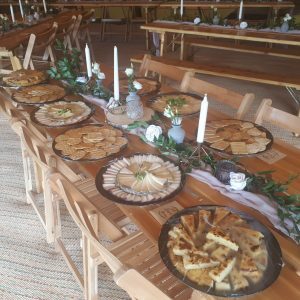 Wedding catering in the UK is big business and there are a lot of wedding catering options to choose from, so it makes sense to shop around for the perfect wedding catering service for your big day. 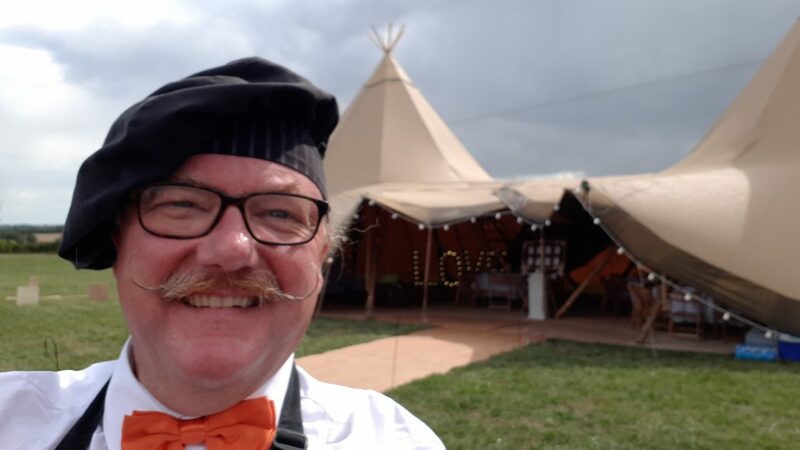 It’s true that as soon as you mention the fact that you want a catering service for your wedding many caterers and wedding venues will put the price up just because it’s catering for a wedding. At Your Paella we give you the price for our service and never charge more just because it’s catering for a wedding. 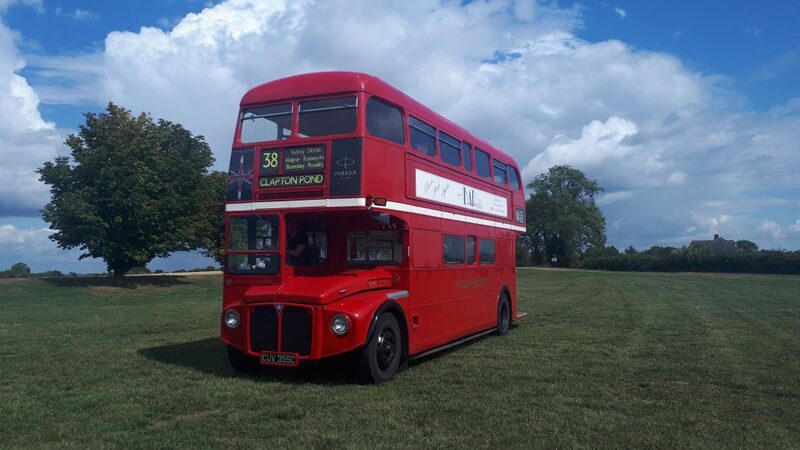 Wedding Catering With A Difference. Paella wedding catering can really offer you so much more than the standard meat and 2 veg option. When your guests see the huge Paella pans sitting on top of the famous Your Paella “Paella Cart” the excitement begins to rise. Then they have the added bonus of watching professional Paella chef’s cooking delicious Paellas in front of their very eyes. The aromas of high quality Spanish chorizo sausage start to fill the air as the chorizo starts to sizzle in the hot extra virgin olive oil. Then the loud frying sound as the onion is poured into the large Paella pans is a head turner adding even more mouth watering aroma in the air. As the Paella chef continues to ad more ingredients to the large Paella pans your guests can be served Spanish style canapes. These bite size canapes are just enough to bring your guests appetite to the front of their mind and by now the Paella’s are bubbling away sending even more delicious aromas in to the air around them. The whole Paella wedding catering experience, with it’s cooking theater in full swing will really wow you and your guests. All this excitement before you have even tasted Your Paella! Now the time has come and Your Paella is now ready to be served from the Your Paella “Paella Cart” by the uniformed Paella chef that has been cooking with great ease and skill. Paella wedding catering with Your Paella really is something you and your guests will remember. If you’re interested in giving your guests something that is cost effective, healthy, tasty and entertaining at your wedding you can contact us or call 07989079231 and we will be more than happy to give you any advice you would like. 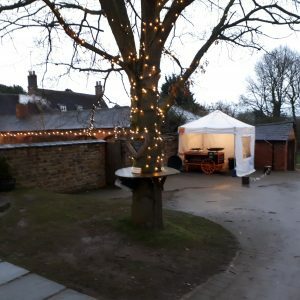 We were Paella Catering in Northamptonshire at a lovely venue called Dodmoor House in Weedon Northamptonshire. You can check out the venue if you click here. The staff were very helpful and well organised. The venue has good parking and is a perfect site to host a wedding. As usual we arrived in good time to set up and the wedding was in full swing. 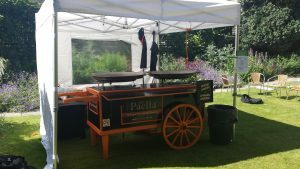 In no time at all we had unload our famous “Paella Cart” and began to get everything in place and ready to cook for the 120 evening guests. The bride and groom had opted for 10 vegetarian Paella, 55 meat Paella with the Spanish Chorizo sausage and breast of chicken and 55 of our mixed Paella with Spanish Chorizo sausage breast of chicken and mixed shellfish. We use de-shelled shellfish so the guests don’t have to use their fingers while eating Your Paella. Paella Catering no matter the weather. Although the weather wasn’t the best it never dampened the party atmosphere and everyone seemed to be having a great time with the live music and plentyfull amounts of Paella to soak up some of the alcohol. 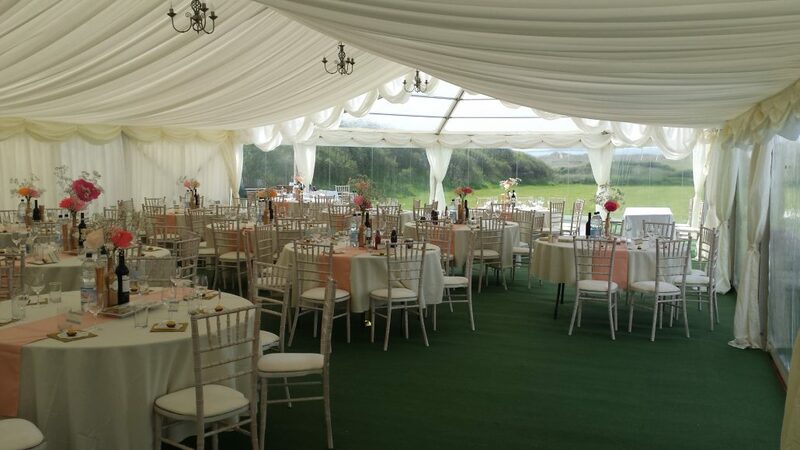 Some wedding venues won’t allow outside caterers to attend but Dodmoor House had no problem allowing the bride and groom to choose the outside catering company’s that they wanted for their special day. We even got to taste some of the other caterers food and the lamb was delicious. If you are looking for a wedding venue in Northamptonshire, I would say that this would be a great venue to check out. If you’re interested in having Paella at your wedding or party, please contact us as we are always happy to give free no obligation quotes and just because it’s a wedding we won’t charge more than we normally would charge for our services like some other company’s do. 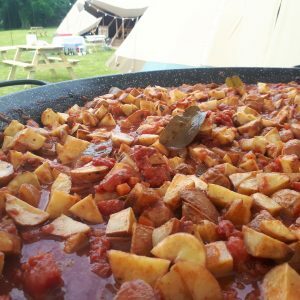 You can also view our main website www.yourpaella.co.uk for much more information.